Rose Tiles Say,"I Love My Home!" Whether you favor simple, single Rugosas, plump Bourbons, old-fashioned Teas or the rainbow of modern hybrids, your love of roses is in line with an exuberant tradition, dating back thousands of years. Roses have graced the palaces of Chinese and Roman Emperors, Middle Eastern Sultans and the gardens of Medieval Kings. Prized for their fragrance, the use of roses in perfumes is ancient and they have also long been valued for medicinal properties. Roses remain a first choice of American gardeners looking for months of reliable, gorgeous color and scent, with modern varieties that bloom from the first warmth of spring to the first frost of winter. But do you miss your roses in the coldest part of the year? Weep no more! Our stunning Rose Tiles bring year-round bloom to any part of your home. Imagine the stately and lovely dignity of your fireplace, accented with Rose Tiles that are ready to be grouted in amongst brick, stone or other tiles. How about a kitchen back splash, transformed into a glowing bouquet with these pretty Rose Tiles, perhaps intermixed with lovely green hues in solid-color tiles? Or, bring our Rose Tiles outdoors and incorporate them into a garden wall mosaic. 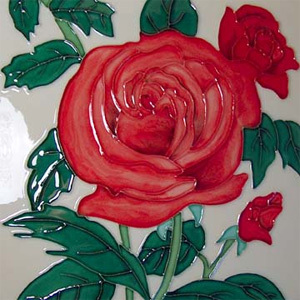 Our hand-painted ceramic Rose Tiles give you roses anywhere you want them, any day of the year. Now, that's something to celebrate!